Happy One (/Eleven) Year Anniversary Houston! On March 31, 2013 I packed up my bags, bid NYC a final farewell, and returned home to my Texas motherland. So while I've *technically* lived in the greater Houston area for an accumulation of 11 years (because I was born here and did a large part of my growing up around these parts), I like to think of it as my 1 year anniversary since I had been away for 10 years. That math may or may not add up. Go with it. So, Happy (almost) 1 Year Anniversary Houston!! To celebrate properly (with an homage to food, obvs. ), I have ranked my top 10 favorite Houston dishes I've had in the past year to reminisce/drool over and share with you all. 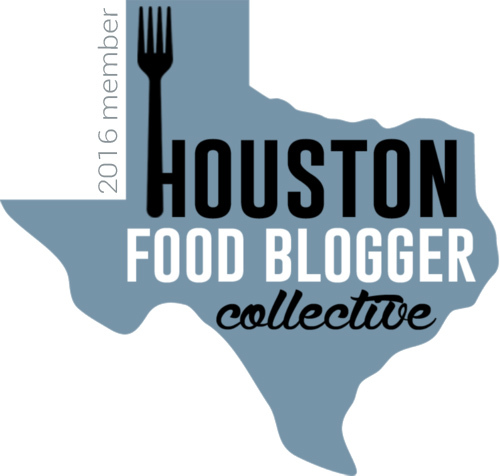 So without further adieu here is my completely 100% biased opinion of my top 10 favorite dishes in Houston from the last 365 days. My friend Meredith and I went to Mr. Peeples for Happy Hour before seeing The Nutcracker, and it was the perfect pre-show spot. With a very decently priced Happy Hour menu, she and I were able to try a variety of small plates. 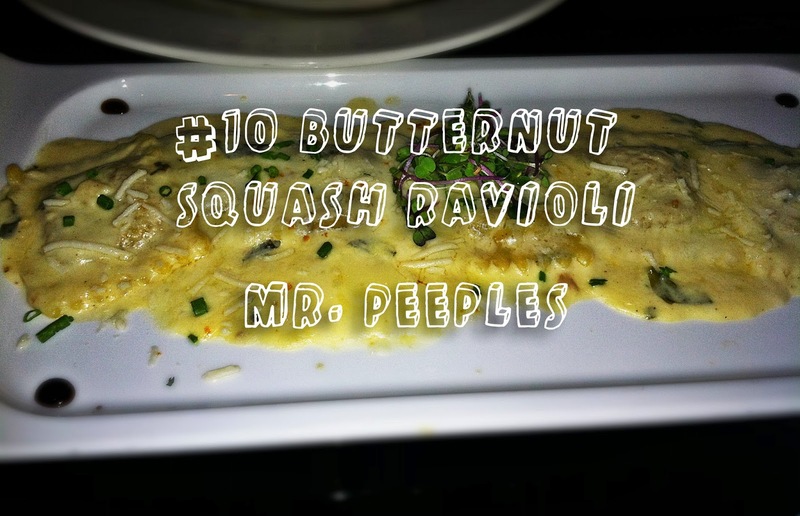 The shining star of these dishes, in my opinion, was the Butternut Squash Ravioli. Savory! Sweet! Light! Hearty! Holy Moly Ravioli, it encompassed a whole slew of juxtaposing flavors and characteristics that made me exercise an obscene amount of restraint from licking the plate clean. On my second friend date with my friend Megan (with whom I share a "bromance"), she introduced me to Oporto Wine Cafe's Happy Hour. Like Mr. Peeples, Oporto has a very inexpensive Happy Hour list. Unlike Mr. Peeples, there are about thirty different Happy Hour apps to choose from. Not even knowing where to begin, Megan said we absolutely had to get the Spinach and Aritichoke Crostini. 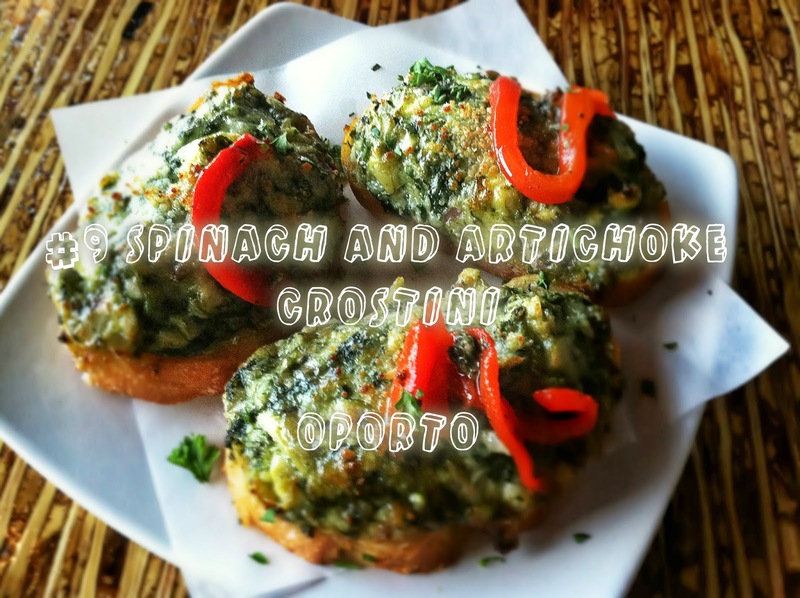 Imagine the best spinach and artichoke dip you've ever had in your life but BETTER, put that dip onto a perfectly crispy crostini, add a dash of heaven, and that's what this is. First off, I give Beaver's an A++ for creativity on this one. 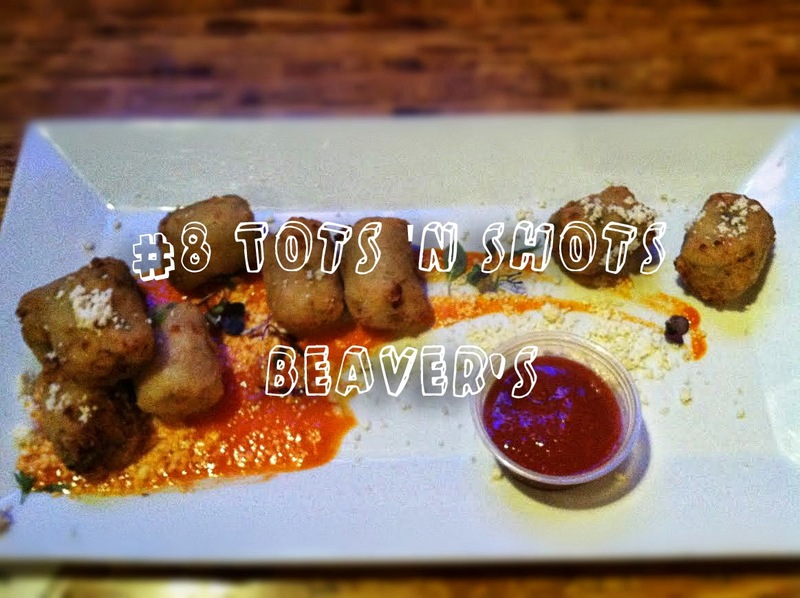 Tots 'N Shots, AKA green chile pimento cheese risotto "tots" with a bloody mary dipping sauce? Absolutely BRILLIANT. And not only are they brilliant, but the flavors are so interesting and delicious. When my best friend Courtney came from NYC to Houston for a visit, we shared this appetizer and fell completely in love. With the tots, not each other. Okay, maybe with each other. Tots have a way of igniting romance. 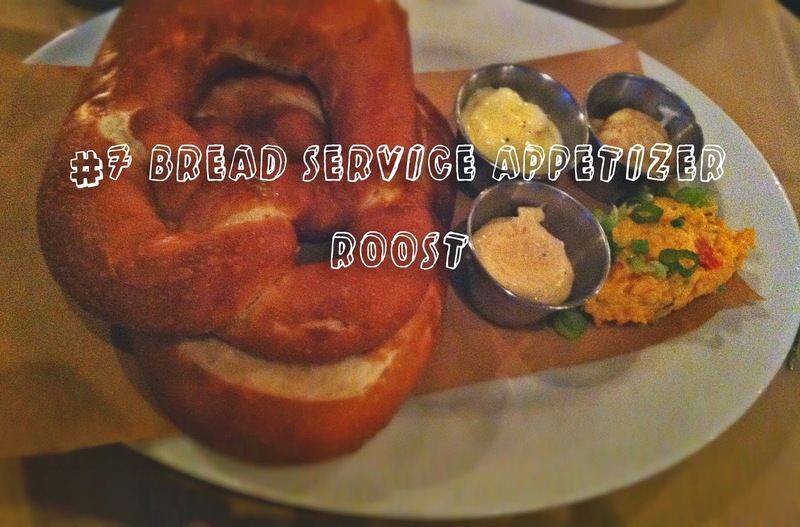 My bro Megan and I also went to Roost, where we not only experienced The Crazy Cauliflower Incident of My Life, but we also experienced the transcendence of their Bread Service Appetizer. Never quite the same, the bread of the day is served with three different butters and a cheese spread. For such a seemingly simple dish that would normally get overlooked, Roost sure has created a piece of art with this appetizer. There are so many delicious options and flavors involved in the Bread Service Appetizer, this is one dish you can't miss at Roost. You know how leftover french fries are never good? 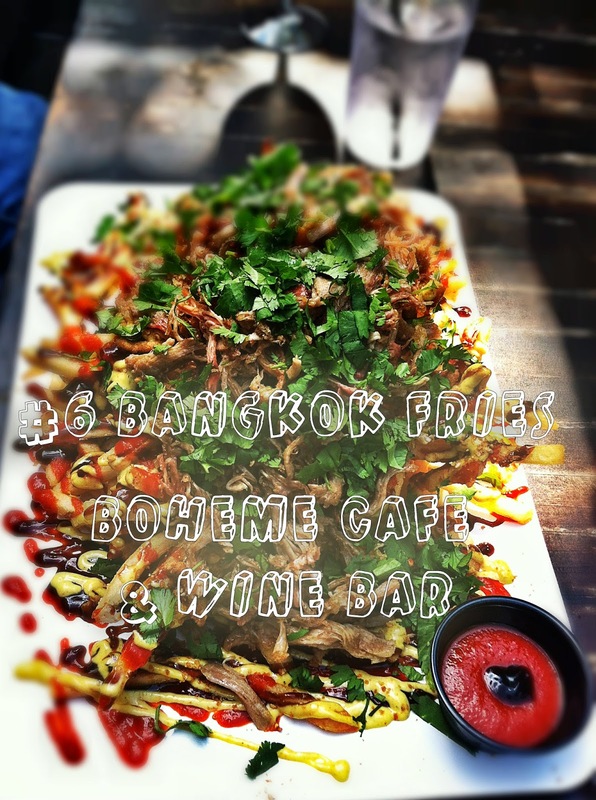 Let's just say several days after eating lunch at Boheme with my mom, I was gorging on leftover Bangkok Fries from Boheme - cold and straight out of the container (how's that for a visual?) - for breakfast, several days after. AND THEY WERE JUST AS INCREDIBLE. The Bangkok Fries are trashed up, beautiful, they-shouldn't-be-good-but-dammit-if-they're-not-some-of-the-best-things-ever french fries. Filled with a smorgasbord of flavors (Sriracha! Minced pork! Crispy fried onions! Yellow curry mayo! Crushed sesame sticks! Cilantro! EXPLOSION!!! ), they really are a force to be reckoned with. Absolutely phenomenal. And here we find ourselves in the Top 5! 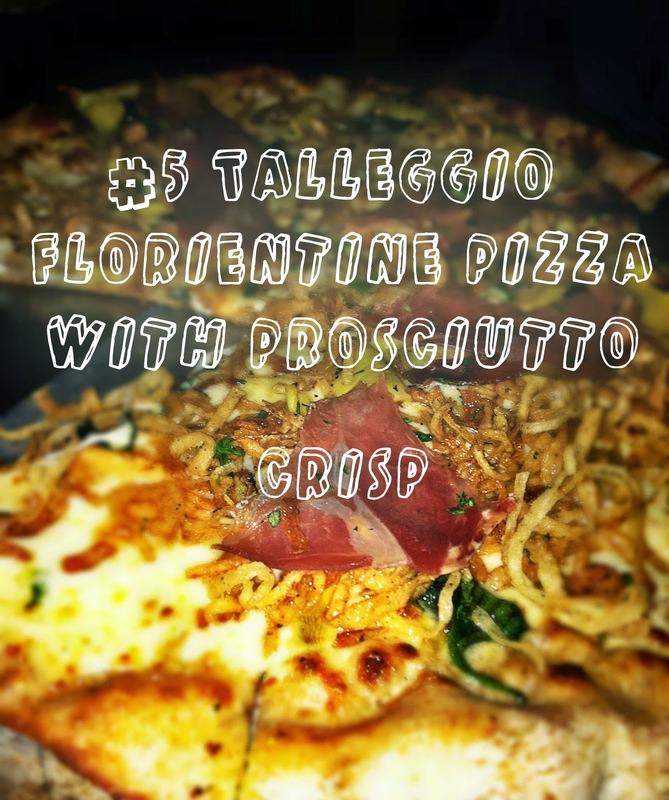 When my friend Lenny recommended CRISP to me over the summer, little did I know I was going to be literally dreaming about the Talleggio Florentine Pizza with prosciutto for months to come. This pizza is divine. Every bite was beyond pleasurable and utterly sensational. The taleggio cheese, creamy spinach, marinated artichoke, crispy onion, truffle oil, and prosciutto blended together in perfect harmony. 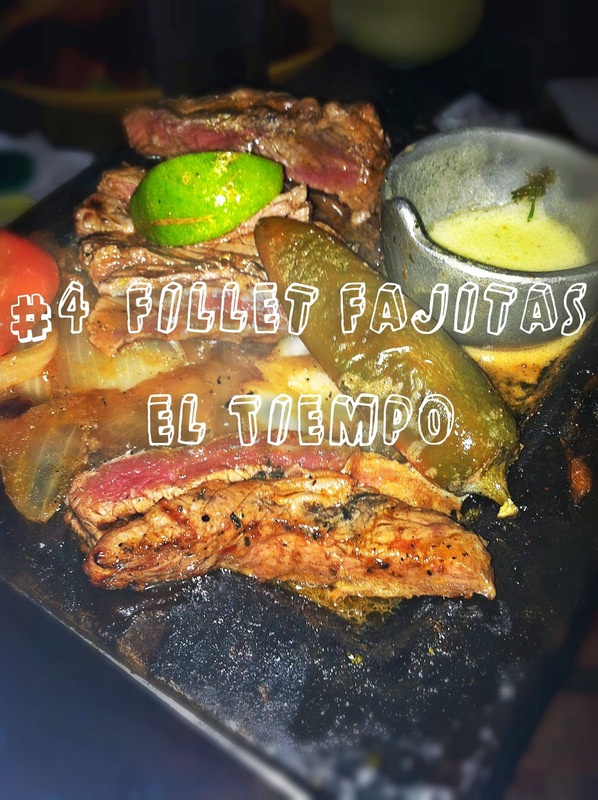 My friend Courtney claims that now that I've introduced her to the Fillet Fajitas at El Tiempo, all other fajitas have been ruined for her. And I wholeheartedly have to agree. The meat is so tender and perfect, you could eat it like a steak with a good glass of red wine. OR you could add their butter and Berry Sauce, load up your fixin's, wrap it in a fresh flour tortilla, and experience the most perfect fajita on God's green earth. Listen, I am absolutely not one to rave about a salad. In fact, the thought of having a salad as a whole meal annoys me. How sad for all parties involved, the eater and the eaten! But sometimes I go out on a limb and order a salad as an entree, and my whole world gets thrown out of orbit. 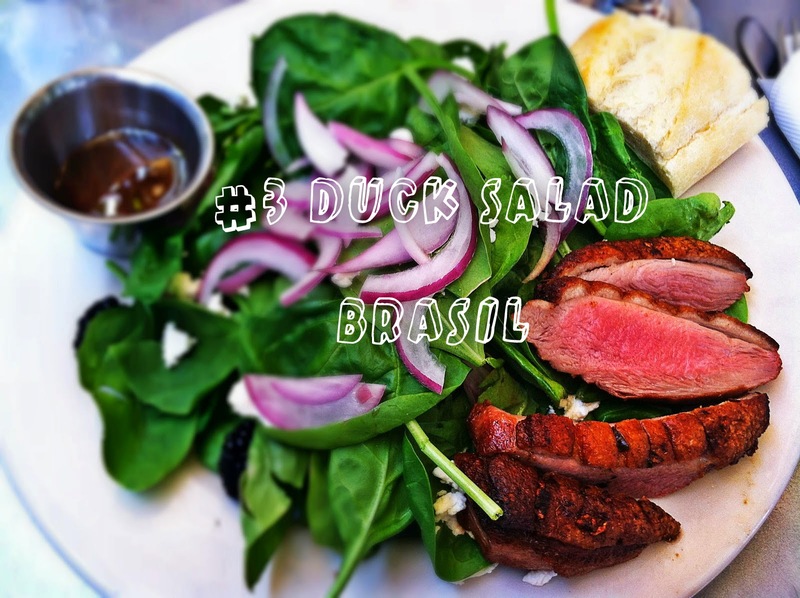 Such is the case with the Duck Salad at Brasil. The tender duck is the main attraction, complimented perfectly by crisp red onions, creamy goat cheese, and tart blackberries. Every time I go back to Brasil I vow to try something new, but I always go back to this. I've sampled the dishes of friends and family there, but everything else pales in comparison. Light, yet indulgent, and absolutely perfect. THIS STEAK, GAH. My mouth is watering just thinking about it. 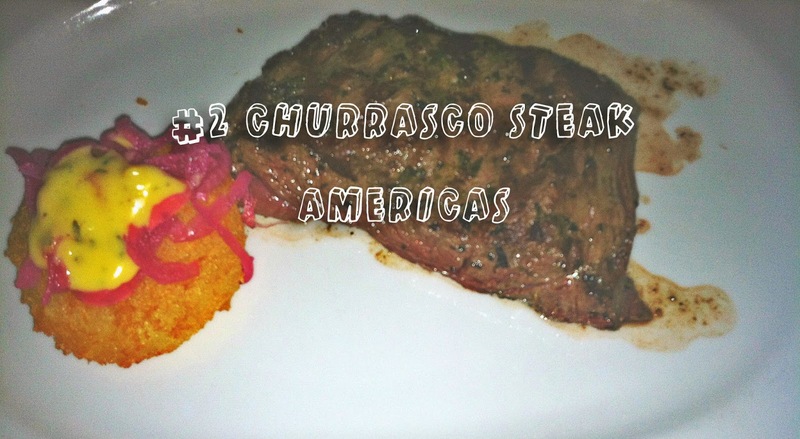 The world-renowned Churrasco Steak at Américas is one phenomenal steak. I remember being completely dumbfounded as I cut through the steak with a butter knife. The Churrasco steak is cooked in a chimichurri seasoning and is so juicy I want to cry just thinking about it! (But I won't for your sake). My numero uno dish was an absolute no-brainer. 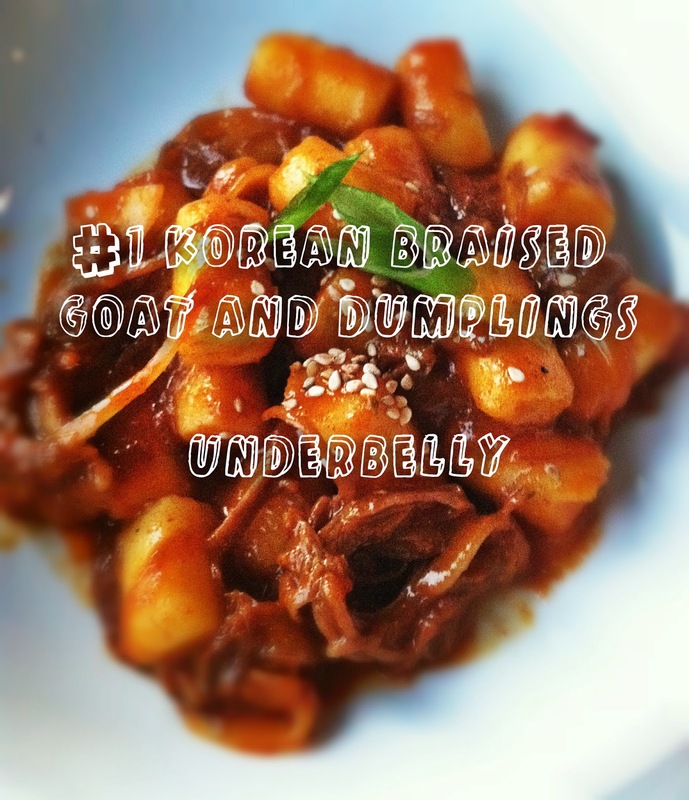 Everything about Underbelly's Korean Braised Goat and Dumplings is simply exquisite. They have the perfect amount of spice, the perfect amount of sweet, the perfect amount of savory, and the perfect amount of varying textures - The dumplings are soft with an ever-so-slightly crisped exterior and the goat is melt-in-your-mouth tender. This carefully executed, delicate, stunning dish provides the diner with a complete otherworldly experience. Simply astounding. From Left to Right: Caramel popcorn pot de crème & fried pretzel at Underbelly, Texas Turkey Sandwich at Spec's, El Gallo Dip at El Gallo, Bacon Bacon Burger at Christian's Tailgate, Perry's Famous Pork Chop at Perry's Steakhouse. From Left to Right: BLT and Brie Sandwich at Chatter's Cafe & Bistro, Truffle Mushroom Pizza at Boheme Cafe & Wine Bar, Farmer's Market Ceviche at Benjy's, Toasted Supreme Bagel with Lox Spread at Hot Bagel Shop, and Fried (Dancing) Cauliflower at Roost. So there you have it folks! My Best of Houston list from the past year of being back. It's been such an adventure trying so many new flavors and visiting so many interesting places. Thank you to everyone who has been reading along! Happy 1 Year Anniversary, Houston - Here's to many more! *All photos edited in Pixlr & Photoshop.